KidsCuteture is offering our readers a giveaway of a $20 gift certificate! KidsCuteture, a WAHM business run by Elisha Cram, sells various “handmade children’s items that are almost as adorable as your kids.” Some of the items available in the shop include: knitted and crocheted hats, photo props, tutus, cloth diapers and cloth diapering accessories. I received a one size pocket diaper to review, and I’ve purchased fitted diapers and fleece diaper liners from KidsCuteture in the past as well. Though my son Daniel is sensitive to synthetics, the pique lining Elisha uses in her diapers doesn’t bother his skin at all. After enjoying using her fitted diapers for several months, I was excited to try out one of her new pocket diapers. KidsCuteture one size pocket diapers have a three step snap down rise adjustment, and Daniel (at 20 pounds and 30 inches tall) is on the middle rise setting. Per the instructions from KidsCuteture, I washed the pocket diaper once before using it (though it doesn’t need prepping like many other diapers do). The one pre-wear wash is in part to see (before they were soiled) if the inserts would agitate out in my washing machine. I have a HE front-loader machine, and I’ve previously been advised by another diaper seller to never purchase diapers that have these agitate-out-in-the-wash insert systems, since they wouldn’t work with my washer. Needless to say, I was sure this would be the case, but I washed the diaper with the flats stuffed in the pocket anyway. Imagine my surprise when the load finished washing and I retrieved the flats and the cover separately from the washing machine! I’ve since washed the diaper several times with one or both of the flats stuffed in it, and they’ve always agitated out in the wash and become very clean. I’ve tried both line drying and machine drying the diaper and inserts, and both work just fine. Line drying seems extremely easy with this diaper. The outer diaper is nearly dry after retrieving it from the spin cycle in the washing machine and the flats dry very quickly. I hung them out to dry the other day (it was sunny and warm) and all three pieces were completely dry within just three hours—much faster than any of my other diapers that were hanging up at the same time! I’ve used this diaper for both daytime (stuffed with one flat) and nighttime (stuffed with two) and I’ve not had any leakage issues. (Daniel is a heavy wetter and we do sometimes have morning leaks in a few of the other nighttime diaper configurations we’ve tried.) The fit of the diaper is similar to the other pocket diapers I have. It’s not extremely trim, but it’s not the bulkiest diaper I have, either. When it’s stuffed with just one flat, it’s (perhaps, obviously) much slimmer than when it’s stuffed with two. Trimness isn’t a quality in a cloth diaper that I care about very much, to be honest. We buy clothes that fit well over them, and I really enjoy patting Daniel’s fluffy cloth bum! The diaper has elastic at both the front and back (as well as the legs) which makes for a more snug fit around the waist than other diapers I have. It’s not tight at all, nor does it leave red marks, but there is no gaping in the front. I like that feature of the diaper, because whenever there’s even a small gap in the front of Daniel’s diaper, he puts his hands down the gap and pulls at the front of his diaper. Overall, I really liked this pocket diaper. The flats are a very absorbent insert option and they dry quickly after laundering. The diaper is lightweight and the pique lining seems fairly breathable. The flats do need to be folded in quarters and then thirds (I believe this is called the “pad fold”) before being inserted in the pocket, which could be a deterrent for some parents. I personally didn’t find this to be any more work than stuffing any other pocket diaper, and the folding was easy to figure out. The diaper is well-constructed, and I’m sure it will last for a long time! 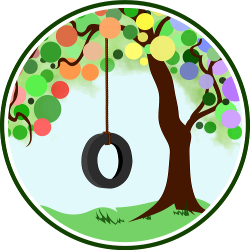 And just for Natural Parents Network and Anktangle readers, KidsCuteture is giving a 10% discount on all orders from now through October 31. Enter code ANKTANGLE10 during the ordering process. For your own chance to win a $20 gift certificate from KidsCuteture, enter by leaving a comment and using our new Rafflecopter system below. Contest is open to the US and Canada. MANDATORY ENTRY: Visit KidsCuteture and tell us what you would buy with your gift certificate if you win! You must enter your name and email address in the Rafflecopter entry system for your entry to count, after leaving a comment on this blog post. Contest closes October 17, 2011, at 11:59 p.m. Eastern Time. 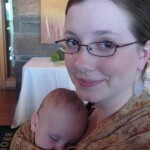 About Our Reviewer: Amy writes about the things she holds close to her heart: family, delicious food, and many aspects of natural parenting. She is passionate about natural childbirth, breastfeeding, gentle, intuitive parenting, and respecting all people, no matter how small. She’s figuring it all out as she goes, following her instincts with her son as her guide. Amy writes at Anktangle. I’d use the certificate to buy the Pocket One-Size Diaper – Tool Print, and use a flat as an insert! I really like the flannel diaper covers – they would make great gifts. I like the army camo, the green and red and also the baseball patterns. The flannel washclothes (pink squares) would also make great gifts. I would use the GC to buy a one sized pocket diaper in the yellow. Although, I’m sure this would go over the GC, I would also have to grab that adorable yoda hat too!! SO flippin’ cute!! I would get a Tutu Fleece Diaper Cover, pocket diaper or Crocheted Sock Monkey Earflap hat.. So many options! 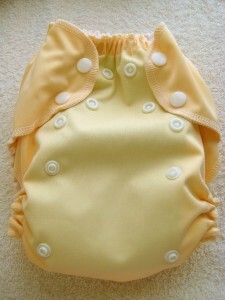 I would love to get a Fitted Diaper – Size Medium – Snap Closure although, there are so many cute things to choose from! I would choose a one size pocket diaper. I love the Tutu Fleece Diaper Cover. SO cute! I would buy a fitted diaper and a set of fleece liners. I would buy a pocket diaper. I would buy the fitted cloth diapers. I am always looking for new diapers to try! Either a One size pocket diaper or Fitted diaper. OMG – I would buy the Yoda Hat – How Cute!!!! So many adorable items, but I think I would use it to buy the One-Size Pocket Diaper (green).